Approximately 2,000 Springfield College students, faculty, staff, and alumni took part in the 17th annual Humanics in Action Day on Sept. 23, a day of community service throughout the city of Springfield. More than 100 projects were fulfilled by college work groups, who performed services for schools, churches, senior-citizen facilities, child-care centers, community organizations, city agencies, and neighborhoods. There were educational projects for school children, including students reading to youngsters at the Brookings School. The majority of the volunteers participated in many indoor and outdoor painting projects, clean-up/fix-up projects, landscaping, and a host of other indoor and outdoor services. The day started with Springfield College student trustee Moriah Billups leading the opening ceremonies at Blake Track, which included welcome addresses from both Springfield College President Mary-Beth Cooper and Springfield Mayor Domenic Sarno. Old Hill Neighborhood Council President Barbara Gresham and Upper Hill Neighborhood Council Vice President Bobby Hartsfield also greeted students. 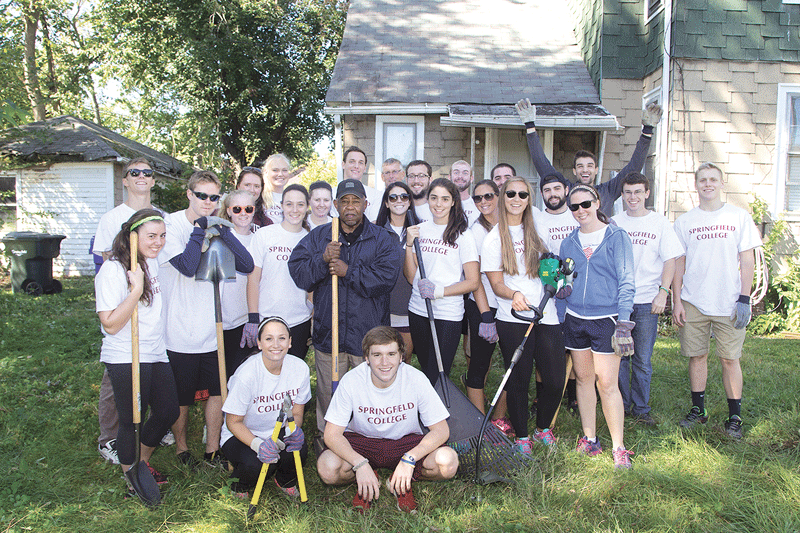 Humanics in Action Day highlights the commitment by Springfield College to year-round community-based service programs. 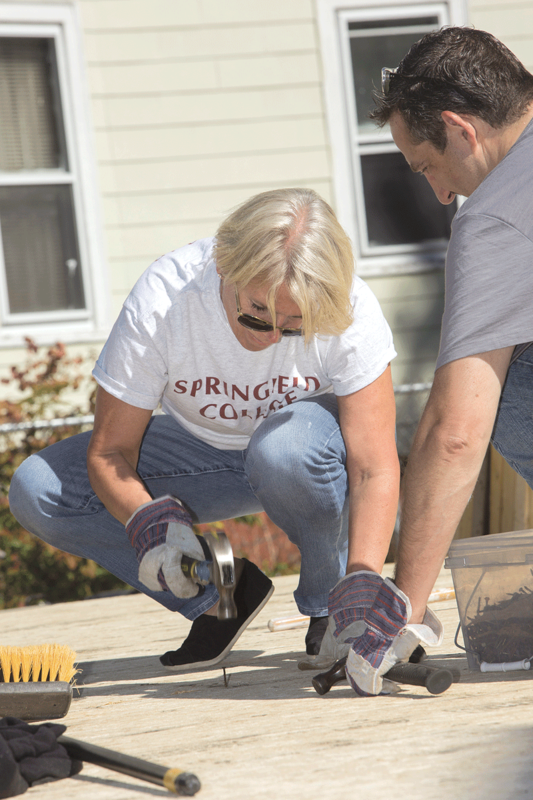 Springfield College students contribute more than 150,000 hours of service annually to schools, neighborhood organizations, and city programs. 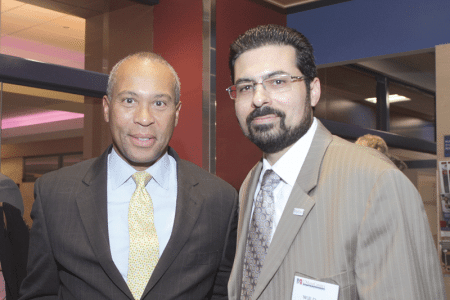 More than 200 area business leaders, UMass administrators, and elected officials gathered at the recently opened UMass Center at Springfield for the facility’s official ribbon cutting. Top, dignitaries led by Gov. 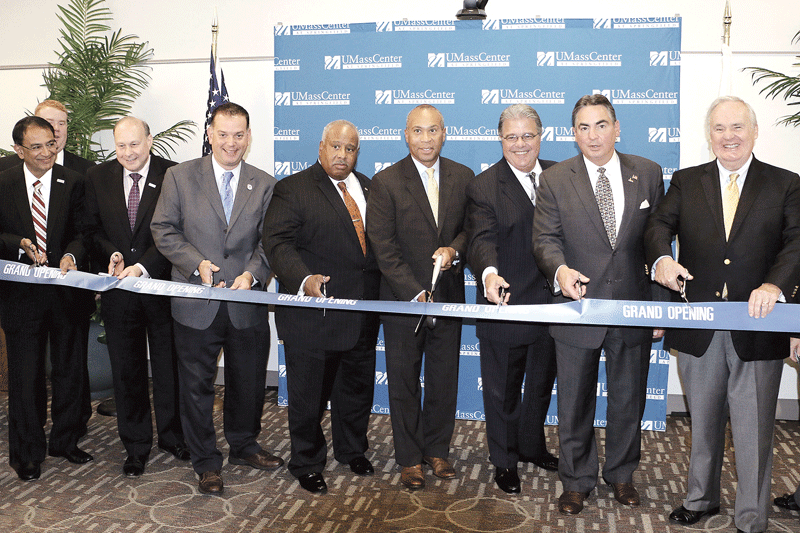 Deval Patrick (center) UMass President Robert Caret (third from right), and Springfield Mayor Domenic Sarno (second from right) handle the honors. At bottom, Patrick with William Davila, director of operations for the center.